Monarch butterfly on Swamp Milkweed (Asclepias incarnata) at the WILD Center. Trout Unlimited has a cost share grant project through the USDA to conduct stream restoration, and plant prairie back along the stream banks in the Wisconsin and the Minnesota Driftless Area. The Southwest Grasslands Stream Conservation Area covers portions of Dane, Iowa, and Lafayette Counties. 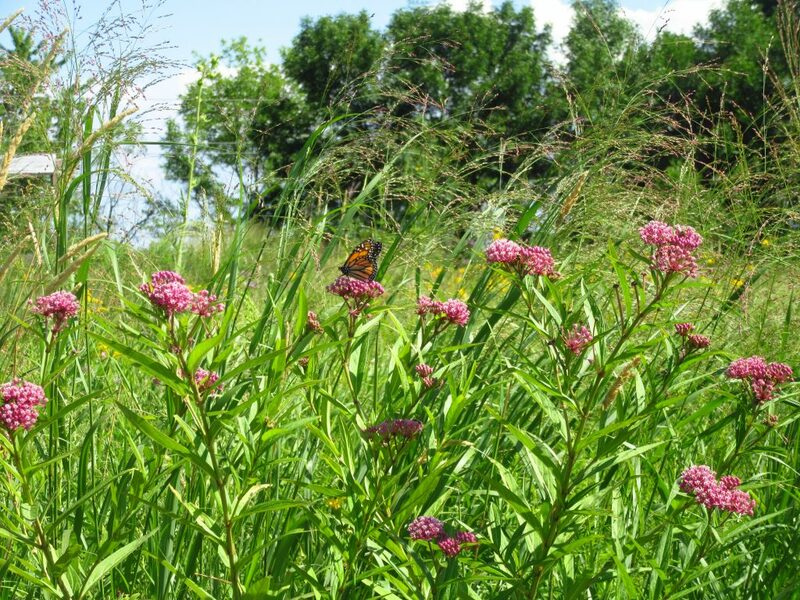 Currently Driftless Area Land Conservancy has a monarch butterfly grant to manage and restore prairie in the region. “TPE’s Milkweed to Monarchs initiative gives members and volunteers a Grassroots Conservation in Action approach to this threat to Monarchs….By collecting your milkweed seeds this fall, you will be making a difference and together we will have a big impact with this restoration effort. For more details about this initiative and collecting the seed go to the referenced blog posting. For details on how to gather milkweed pods and collect the seed, go to Wild Ones Milkweed Basics.